Normally the action linked to a button or a click box is activated by clicking on them. However it is possible to add a shortcut key as an alternative method of activation or even to replace the click entirely by a shortcut key. You should be careful: it is not possible to have different active objects (like buttons, click boxes) on one slide to have the same shortcut key, not even when they are visible at different moments in the timeline. If you assign the same shortcut key, only one object will react to it: the object that is the lowest on the timeline (= the first created object if you did not change the order). Flash-adepts will use the words Z-order or stacking order. To illustrate this I realized a small SWF with Captivate. It has two introduction slides. On the second introduction slide I used the Interactive label Widget, created by Yves Riel (@Whyves_ on Twitter - http://blog.flash-factor.com). Slides 3-6 seem identical, they have four interactive objects, two buttons (that show a hidden Text Caption) and two click boxes over a drawing shape that jump to a following slide (YellowSlide/BlueSlide). 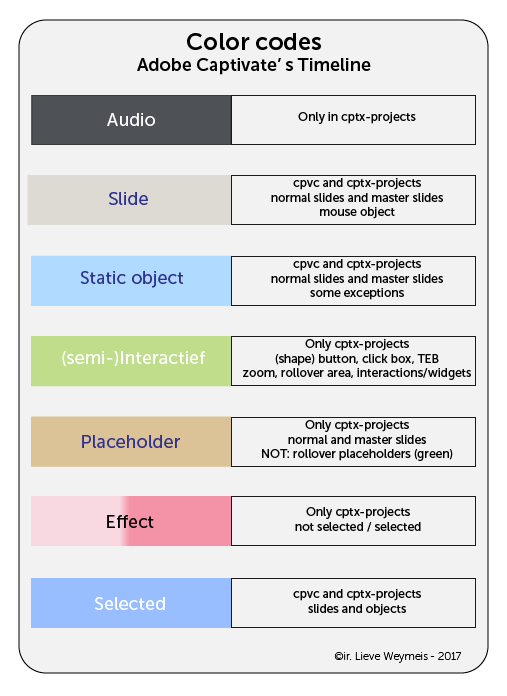 The only difference between the four slides is the stacking order: on each slide another interactive object will have the 'priority place' in the timeline. The shortcut assigned to the objects is the Enter-key and it is not an alternative, it is the only way to activate the button or click box. Try it out, use Enter on pages 3-6 and you will see that on each slide only one object can be activated. You will be able to see an image of the Timeline corresponding with each slide to check the stacking order. Timeline is in a rollover image, that you can open when rolling over the information caption.